Can’t Wait for the NBA Season to Kick-off? Play King of the Court Today! For the past few years, I have been documenting my pursuit of the ultimate augmented reality experience. NBA King of the Court, recently launched by Ogmento on the iPhone app store and the Android Market, is a major landmark for me along this fascinating path. 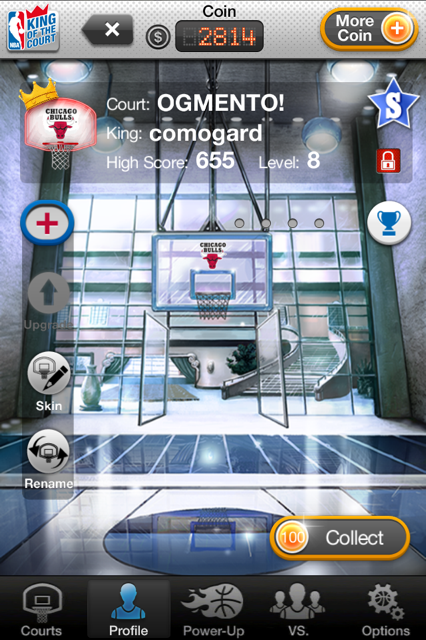 King of the Court has the ingredients of a deeply engaging game: a free-to-play casual mechanic that anyone feels compelled to play (shooting hoops to become king of the court), a deeper strategy level that draws you in (protect and extend your kingdom by carefully managing your resources), social rivalry that gets under your skin (schooling your friends and foes in daily competitions), all wrapped up in one of the world’s most favorite sport franchise – the NBA. When an alert pops up on your phone, announcing that your treasured and highly customized home court has been attacked (see mine in this post), it gets pretty visceral and hard to remain on the sidelines. • Royal Courts! – Climb the royal ranks and face off against players worldwide to become King of the World! • Customize your player – Pick your favorite NBA team jersey as your avatar or use your Facebook photo! • Recruitment Bonuses! Get more Basketballs when inviting friends to play! Now, here’s an invaluable and timely tip exclusively for Games Alfresco readers: when the NBA season starts (finally!) on Christmas day with much fanfare about the game, the tide of players will rise and the stakes will get much higher. So to stay on top and ride the wave all the way to the finals, grab your local courts today, land the highest score by any means necessary (99 cents can get your pretty far), and promptly fortify them with killer defense power ups. By the time the tide comes rushing in you’ll be riding the wave, collecting royalties for your courts and asserting yourself as THE unassailable king. Rule the courts! Rule the world! Are you taking control of your neighborhood yet? Share with us your experience on facebook and twitter. Here’s the latest AR dish from Ohan Oda and Steve Feiner at Columbia University‘s Computer Graphics and User Interfaces Lab: an augmented reality marble game that uses gravity as a game controller. No iPhone required. See the video and recipe after the jump.